AMERICAN TALLEYRAND. Comments on Hillary Clinton and Political Realism. Please indicate below the emails to which you want to send this article: AMERICAN TALLEYRAND. Comments on Hillary Clinton and Political Realism. The highlight of the Democratic primaries so far, for me, has been watching Clintonites defend their latest candidate by appeals to Burkean conservatism and “political realism.” I’m glad they’re bringing it up themselves. It helps me clarify the problems the Clintons pose for our political process and discourse. Put bluntly, though Hillary’s certainly a seasoned Democrat, I don’t think of her as being all that crazy about democratization in the truest sense. She’s skeptical of it, impatient with it, visibly uncomfortable around it— owing largely to her own brand of political realism. This isn’t the realism that many of her supporters ascribe to her: prudence, pragmatism, political sobriety. These are admirable political attributes that I’ll mention she probably has, without discussing how she chooses to wield them. The big problem— for me a very big problem— is that she’s a realist in another sense, a “political realism” that comfortably places her in the company of power-jockeys like Talleyrand, Metternich, and Kissinger. Political realism has some competing definitions, so I’ll give you mine, then explain why Hillary fits the bill and why it’s the last thing we need more of right now. For the species of realists I have in mind, politics is and should be the affair of statesmen and “decision-makers” rather than publics or citizens. Politics, for them, is and should be motivated, calculated, and operated wholly in terms of self-interest, whether that “self” is the nation, party, class, constituency, or eagerly ambitious citizen. Too much emphasis on ideas, values, justification — much less principles— should be discarded as a dangerous fanaticism. It’s a chessgame, they’d likely say, and not a Socratic dialogue. Political realists also prefer security and order over serious reform, strive to maintain rather than share power, and consequently tend to have a conservative bias, whatever their political flavor. Bear in mind that many political realists believe that they’re doing some good on balance— Hillary likely does— and this provides rationalization for their ickier maneuverings. Little do they understand that, contrary to their better intentions, the good that they’re promoting is ultimately undermined or reversed by the very political means they’re using to achieve it. You’ll see “incremental change” alright— only in the wrong direction. Perhaps, like me and many others, you believe our most urgent, potentially volatile concern is the overconsolidation of economic and political power, our soft oligarchy of white male supremacy, political privilege, and the corporate capture of American life and politics. If so, ask yourself if you really believe that another Clinton adminstration, run by such realists, can or will halt this trend— or even has the political will to do so. For my part, I have zero faith that it would. Let’s begin with one of the most dismissed but glaring issues: Hillary Clinton is the wife of a former president. Instead of shuddering in embarrassment, instead of pinching their political instincts, some supporters proudly italicize this in her résumé, advertising that their conception of democracy will accommodate four out of the five last presidents being immediate family. Mine will not. Political dynasty, particularly within the same and highest office of the land, should be absolutely incompatible with American democracy. This applies to Bushes and Kennedys no less than to Clintons. In fact, I’d be in favor of a law similar to the 1967 Federal Anti-Nepotism Statute, which restricts presidents from appointing family members to their cabinet, rightly created after (though not necessarily because of) John Kennedy’s appointment of Robert to Attorney General. One family, one president. If it’s good enough for a Burger King sweepstakes, it’s good enough for American democracy. If you accept such anti-democratic arrangements to put the “right person” in office, or believe that it’s merely a one-in-a-billion coincidence, by all means say so. But here we part ways. Symbolic or no, the issue strikes at the very heart of how high office should operate in the United States, and why we as a nation were right to ditch the British some two and a half centuries ago. Those who argue that— technically— this does not count as hereditary power forget that power is perfectly happy remaining de facto. It’s even pretty blasé about who’s included in “the family.” Dynasty is but a caricature of the way power and influence are kept within a tiny sector of society accurately described as the “ruling class,” insufficiently different from the way it changed hands among the Bourbons, Hapsburgs, or Romanovs two centuries ago— a period that deserves some review here. It’s 1815. Shaken and eviscerated by the Napoleonic Wars, the European powers of Austria, Britain, Russia, Prussia, and France sought a peaceful balance of power, through negotiations by diplomats like Talleyrand and Metternich, at the so-called Congress of Vienna. By many measures, the Congress was a success. As Henry Kissinger relates in his book, World Order, “The period between 1815 and the turn of the century was modern Europe’s most peaceful, and the decades immediately following the Congress of Vienna were characterized by an extraordinary balance between legitimacy and power.” This period, which Kissinger looks upon so fondly, ended abruptly with the bloodbath of the first World War. What could— or would— disturb such an equilibrium? Kissinger has an idea. “It was only after the elements of legitimacy in this international order was shaken by the failed revolutions of 1848 that balance was interpreted less as an equilibrium subject to common adjustments and increasingly as a condition in which to prepare for a contest over preeminence.” In fact, it appears that most geopolitical problems of the last three centuries, according to Kissinger, can be traced to the same trouble-maker: the revolutionary spirit! It was this spirit, apparently, that caused heads to roll in the Reign of Terror, this spirit that provoked the uprisings of 1848, that murdered the Romanovs and that pulled the trigger on Archduke Ferdinand. Contrary to some, I quite agree that the fanaticism of the Jacobins and the Bolsheviks was more ghastly and counterproductive than necessary; there’s something in the revolutionary spirit that soon blinds, cannibalizes, and betrays. However, it’s telling that Kissinger doesn’t spend much time on the question of what conditions— social, political, or economic— awaken this spirit in the first place. He praises the conservative 19th century political order for its “balance between legitimacy and power,” a period when the Continent boiled with hatred for monarchy and a desperation for democracy. My question then for Henry is: legitimacy and power for whom? How could the populations be so ungrateful for the nice Holy Alliance? Likewise, for Kissinger, the French Revolution was caused more by Enlightenment ideas run amok than they were by the Kings Louis bankrupting the nation to wage war, grab power, and maintain the excellent taste of the upper classes. All this unpleasantness could all have been avoided if the masses would have politely starved in peace. Wouldn’t it be better instead, taking hints from Thomas Piketty or Karl Polanyi, to address the deeper causes of these tensions and unrest, the social, economic and political conditions that lead to crisis? Wouldn’t it be wiser, more “pragmatic,” to democratically defuse them rather than papering them over with a diplomatic veneer of order and stability? What does such a pivot now look like?— well, the TPP. The negotiations were less festive than the Congress of Vienna, but the form was more or less the same: a gathering of “decision-makers,” free from all democratic interference, coming together to top-secretly negotiate the terms and horizon of the 21st century economic order. Totally unrelated to the election cycle, Clinton has since vacillated on the agreement she once called a “gold standard,” citing problems with labor and other provisions (though of course not, where the real action is, in intellectual property law). The problem though is not just with a few provisions. It’s the entire form of politics, a form that Hillary exemplifies. If the titans of industry plot out the future of the Pacific economy without any involvement of citizens or advocacy groups, and only preciously limited access granted for our representatives, I can already tell you what it’s going to look like and who the beneficiaries will be. Realists should know this better than anybody. Bill Clinton assumed office on a populist wave then quickly began playing matchmaker between Wall Street and the Democratic Party, surprising even the financial sector with his generosity. Obama came to power with a stridently progressive vibe, then surrounded himself with Holder, Geithner, and Summers, who made sure the banks were rewarded for their malfeasance in the 2008 crisis. Both presidents were better than the Bush before them, absolutely, but under both, the dangerous overconsolidation of political and economic power continued unabated. Ask yourself again, if Bill and Barack couldn’t or wouldn’t break this trend, what could possibly give you more faith in Hillary, a candidate who styles herself as their yet more conservative successor, a candidate who refuses to foreswear a Wall Street Treasury Secretary, and a candidate unprecedentedly indebted to the powers she vows to combat? How is Hillary Clinton anything but a step backwards, a further capitulation to the Reaganism that New Democrats have still to this day not been willing or able to reverse? 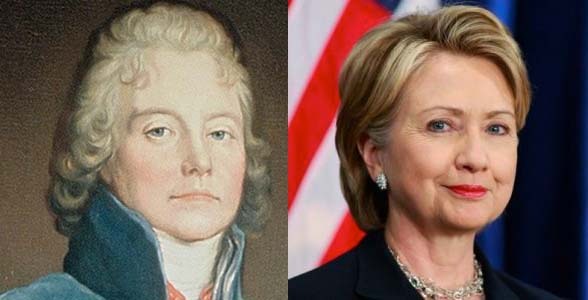 Hillary is not, despite some meaningful comparisons, literally an “American Talleyrand.” Likewise, Bernie Sanders is no Robespierre, no Bonaparte, and no Bolshevik. The revolution he’s talking about— I sometimes wish he’d use a different word— is in contradistinction to the so-called Reagan Revolution and Gingrich Revolution. He is pushing as he says, a “revitalization of democracy,” and an FDR progressivism with strongly millenial values. Again, if you, like me and many others, believe that our most urgent problem is the overconsolidation of political and economic power, such a democratization and something like an FDRish progressivism is the least we can do— but not what Clinton represents. Bernie himself does not represent fanaticism, revolution, or political instability; instead, he’s offering a political platform to help us avoid them. I have plenty of differences with Sanders, and if and when he assumes office he will meet a resistance that will grind down most of his momentum; he is not a political savior, as he readily admits. However, it’s actually hard to imagine, given what we know of Hillary, that she would have any momentum to start with, any political will for reforming the campaign finance system (the woman was born to fundraise), democratizing a sclerotic political establishment (of which she’s the very emblem), or reversing the trends of concentrating economic power (an issue to which, as even Biden admits, she’s a newcomer). And as imperative as it is to avoid a Trump or Cruz presidency, remember what kind of conditions— social, political, or economic— make a Trump or Cruz presidency this possible to begin with. Much of the public, many of whom are victims of these overconcentrations of power, will look to blame the powerless rather than the powerful, and the powerful will only encourage the this rhetoric, as cover. We’ll see xenophobia, racism, tribalism, devastation of social support systems— even outright fascism and belligerence. But contrary to unsubstantiated Clintonite “hunches,” and in keeping with most general election polls, Hillary is no safer a bet for defeating Trump or Cruz. She is not the “Big Center” as she claims; instead, she falls in between two stools. She is opposed by many in her own party, most independents, and nearly every Republican— not to even speak of voter turnout. But even if she did win the general election this time around, if she continues the legacy of the New Democrats as she’s promised to do, a Trump or Cruz— or perhaps someone worse— will be all the better poised to win the next time. This deferral of disaster, this sticking our heads in the sand, hardly deserves to be called realistic. This entry was posted in politics, power. Bookmark the permalink.